Nowadays, we no longer look up — our noses are always buried in our phone screens. Well, if you don't look at the stars, why not put the stars in your smartphones? Terrible satirical jokes aside, there is a handful of apps out there that do a great job at showing and teaching us about the known celestial bodies. 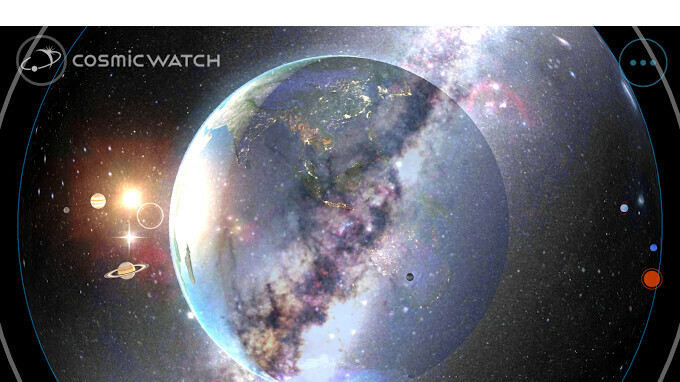 Cosmic Watch is one among them. The app's main purpose is to show you how the Sun, Moon, constellations, and planets in our solar system move around our planet. Its Time Travel feature allows you to speed up time and watch said bodies move around our pale blue dot as fast as you like, giving you a glimpse into the future alignments in our solar neighborhood. A solar eclipse detector and world clock round off the time-centered features. Thanks to a few buttons and toggles, you can change the on-screen graphics — the way that Earth is drawn on screen (realistic or glowing wireframe), add or remove clouds, layer extra spheres that show you where the constellations and other planets are observable now, get a drawing of the horizon, get a compass, equatorial coordinates and others. It's a cool-looking app, but for $5 — it's probably worth a buy for the space geeks out there, not so much the casual user that will open it a total of two times.